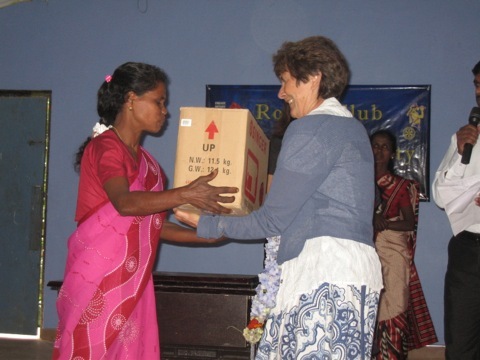 Chairman of the Trustees Joy Palmer Cooper once again visited many of our partnership communities in the Matara and Sabaragamuwa regions in July 2013. She spent time with the Team 2013 Volunteers enjoying their splendid work and achievements and in particular, she shared the wonderful opening ceremony for the well provided by this team in the village of Hippola. Joy was Chief Guest at a ceremony organised by Colombo Mid-City Rotarians in Ramboda, where she handed over 10 sewing machines provided by Project Sri Lanka to ladies in the community. She also visited 2 new sites where the Charity will be providing agro-drinking wells in 2014, these being Thelulla Janapodaya in the Wellawaya district and Mederigama, west of Kandy. Also on this visit, Joy handed over supplies of embroidery and sewing materials provided by friends of the Charity at Sri Sumangala Girls College in Weligama and held various meetings with Rotarians in Colombo and Kandy about potential future projects.